Meet a face that you may be seeing a lot going forward as a member of the Brookfield Chamber of Commerce. Stephanie will be the person providing visibility opportunities to our Members. She is currently developing ad packages for the Inner Chamber Newsletter, the newly launched Chamber Website as well as for the Annual Directory. Coming from a marketing background, Stephanie was a Marketing Analyst for Combe Incorporated (Grecian Formula, Clearasil, Vagisil, Just for Men Hair Color, Lanacane and others) where she interfaced with Wal-Mart and other outlets. From that position she migrated to selling advertising and websites for Advertising Agencies and Chambers of Commerce throughout the country. As part of her sales job for Chamber of Commerce she traveled extensively setting up and selling the advertising to support their initiatives. The Ridgefield Chamber was one of her clients and when her family relocated from Florida to Brookfield 6 years ago she stepped into the position of advertising for that Chamber and as a result has been recruited to handle the advertising for the Brookfield Chamber as well. It is interesting to speak with Stephanie about the focus of the various Chambers that she has worked with throughout the country. The Nantucket Chamber, for example, focused on tourism. The Arkansas Chamber (where Wal-Mart in located) has a paid full time staff of over 10. The Chamber in the Catskills serves such a large area that it does not have a storefront but rather uses as mobile van. Stephanie will be able to increase Chamber revenue, free up some of our overworked volunteers, aid our Executive Director as well as provide some outside insight into Chamber workings and focus. Stephanie, husband Richard, and 12 year old son Andrew, enjoy all sports activities but especially hiking and wrestling. Stephanie’s keys to success include always learning and improving her skills. She stays current and is not afraid to change with the times and industry trends. Flexibility and an open mind are traits that she sees important to personal improvement. 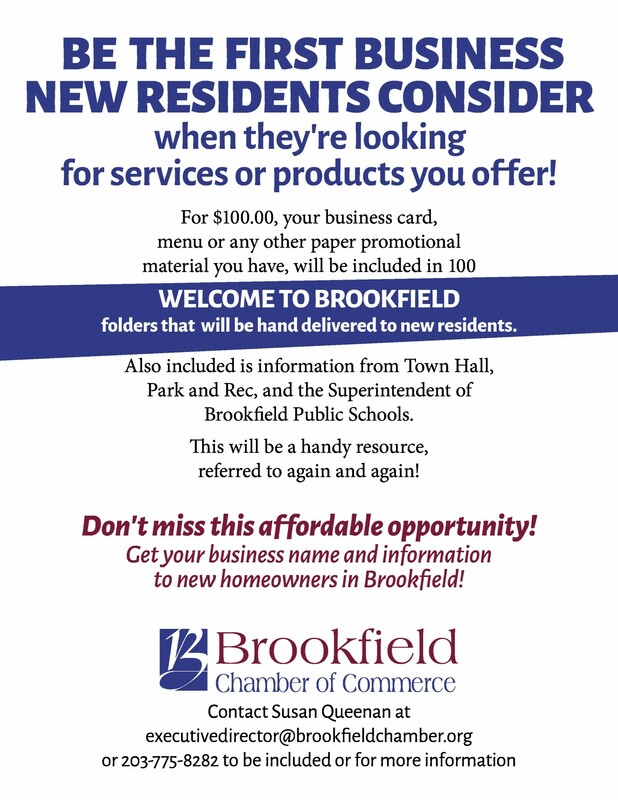 For information about increasing your visibility within the Brookfield Chamber of Commerce and thus the community give Stephanie a call at (203) 770-0808 or email her at spapa@brookfieldchamber.org.